Each family will need to create an account to get started and then you will start a new registration. Every player for Ingersoll this year will be considered a new player. 1. Please ignore the member ID that is not required. 2. When you have finished each participant you will have the choice of register another player or go to check out....do not go to check out until you have finished all your player registrations so you can get any applicable discounts. Below is a promotional video for "LTPD" Long Term Player Development. 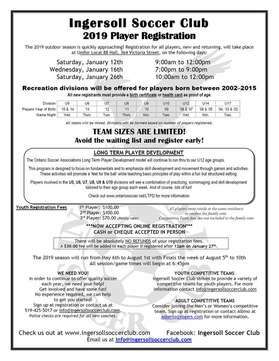 The Ingersoll SC fully supports this Provincial mandate passed down from the Ontario Soccer Association (OSA). For further info? Check out our "LTPD" menu!